Certainly one of the advantages of a homebrew club is the ability to buy in bulk and take advantage of volume discounts. 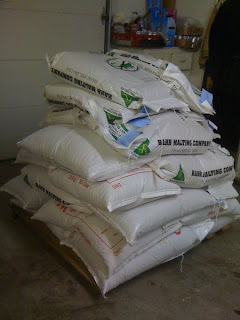 Several folks in my local homebrew club (RIFT) recently put together a bulk grain order. A total of 12 homebrewers took part in our order which resulted in 24 sacks being ordered. The 1,255 lbs of grain arrived this week much to everyone’s pleasure. It would take a 20 bbl batch (620 gallons) to get a 1.055 batch. It would take 66 oz of Chinook hops added at 60 minutes before flame-out to achieve ~30 IBUs of bitterness. Approximately 3 gallons of an yeast slurry or 250 vials of yeast would be needed to meet an appropriate pitching rate if the beer was an ale. Back on the homebrew side, this stash of grain will generate at least one hundred 5-gallon batches or 8-10 batches per homebrewer involved in the buy. Sounds like everyone is going to be busy. “This is grain, which any fool can eat, but for which the Lord intended a more divine means of consumption … Beer!" I think you have an extra 0 in that IBU calculation. Brian, thanks for picking up the error. I had the batch size set for 620 gallons, but did not change the boil volume (which was set for 7 gallons). Hence, the calculations assumed an incredibly poor utilization. Correcting the error (with a 710 gallon boil volume), a much more practical 5.5 lbs of Chinook was yielded. I will update the post to reflect this new number.